How do I name my Klip? When naming your Klip, it’s important to understand the difference between a title and a name. The Klip title can be optionally entered in the Properties pane when you are building a Klip and displays as the label in the Klip. 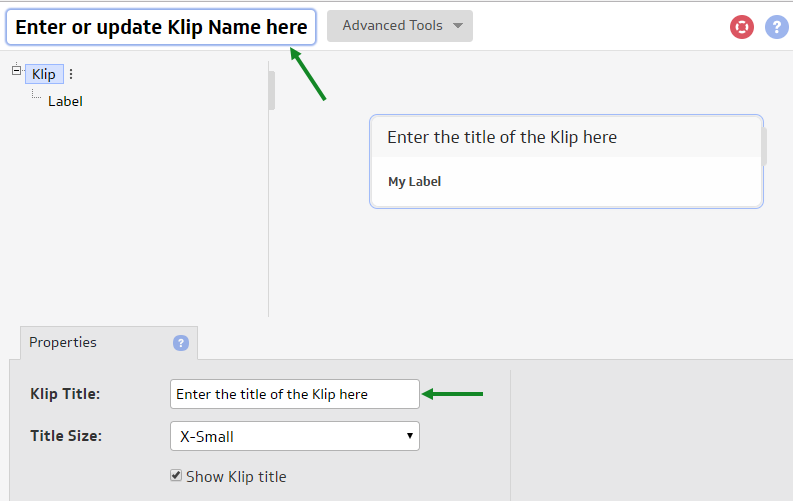 The Klip name displays for the Klip in your list of Klips and when adding your Klip to the dashboard. The name is entered in either the upper-left corner of the Klip Editor when building a Klip or, after clicking Save in the Klip Editor, in the Save your Klip page. If you want to modify the Klip name, you can either do so by clicking Klips, selecting a Klip from the list, and clicking the Edit Properties button after About this Klip or in the upper-left corner of the Klip Editor. NOTE: If, when you are building a Klip, you save the Klip without entering a Klip name, the text you entered for the Klip Title will also be used as the name of the Klip.